This week I’m showing you how to make this ultimate layer cake with chocolate and salted caramel. I planned this recipe out and I’ve only just finally got round to baking it. The cake consists of 4 tiers of chocolate fudge cake layered with salted caramel buttercream. Make for special occasions such as birthday’s or just as a weekend treat and it will go down a treat. 1. To make the cake: Preheat your oven to . Line two 8 or 9-inch inch cake tins with some baking parchment and grease the sides with butter. Sift all the dry ingredients into a large mixing bowl (the flour, sugar, bicarb, baking powder, salt and cocoa.) Mix with a wooden spoon until combined. 2. Now add the eggs, buttermilk, oil and the coffee. Whisk until all the ingredients are well combined and they are no lumps in the batter. 3. Distribute the cake mix into the tins and then bake for 35-40 minutes or until the cakes are well risen and a cake tester comes out clean. Once cooked, allow to cool in tins for 30 minutes then remove from tins and leave to cool completely on a wire rack. 4. To make the buttercream: In the bowl of an electric stand mixer, add the butter, the icing sugar and the vanilla. Whisk on low speed for until the mixture comes together, then gradually turn the speed up to medium and whisk for 5 minutes until the buttercream is very pale and light in colour. Then gently fold in the caramel and salt. 5. To assemble the cake: Cut each half into half again- so you have four layers of cake. Place one layer of cake down on a cake stand. Spread about a heaped tablespoon of the buttercream on and spread over. Then top with another layer of cake, spread with buttercream. Repeat this step with the other 2 layers of cake. Then spread a nice layer of the buttercream over the top of the cake. Then I topped the cake with some delicious chocolate caramel pieces. The cake looks delicious. I have to try this. And congrats on your success. Wow!! I definitely want a LARGE slice of this! Ps congrats on your publication!!!! What an absolutely gorgeous cake! I love salted caramel with anything and it is absolutely perfect with chocolate cake. Thanks so much for introducing me to your blog. I will be following along! wow, this cake looks absolutely delicious! Pinning it now so I can make it soon!! What a fabulous cake, looks truly delicious. Many congratulations too. This looks like such a delicious cake, Jessica! I wish I could come and have a piece! Congratulations on getting your recipe in the BBC Good Food mag … that’s amazing news! What a lovely cake, Jess! And how exciting to be featured! Congrats to you! Oh I SO want to sink my fork into this cake!! I LOVE salted caramel, and with chocolate!! !……….I’m coming over!!!! 🙂 Congrats on your feature! That is SO exciting!!! Salted caramel butter cream does it all for me! Oh goodness, four layers of absolute beauty and deliciousness! Swooning at those pictures! Congrats on your feature girl! Congrats lovely! I can see why your recipes would be featured if they’re anything like this glorious cake. Well done! Just found you and your beautiful blog, this cake is totally droolworthy!! Congratulations on the feature. I love salted caramel and together with the deeply dark chocolate cake, what a wonderful combination it is!!! CONGRATULATIONS on your news! I can see why… 🙂 this cake looks amazing! I absolutely love the chocolate-y goodness of it, and that salt and caramel picture? My mouth watered! I can just imagine devouring it! This looks absolutely divine, I love salted caramel! Impressed with the BBC feature, though can see why, love the tips and pictures, and still marvelling at that pouring shot, dropping in from #recipeoftheweek. Congratulations on your wonderful news…. you must be walking on air! Now let’s discuss this cake. Deliciously sinful. Sinfully decadent. Absolutely gorgeous. And one I need to try very soon. Just lovely. SUPER impressive!! Congratulations! Wow that is something to celebrate. But looking at this cake it hardly suprises me. Amazing!! Congratulations Jessica! That’s so cool! And this cake looks wonderful! 4 layers? Caramel? Fudge? Oooohhhh how delicious! AMAZING cake! I could nose dive right into a piece…or two! You had me at salted caramel buttercream! Yum! Wish I had a nice slice of this for dessert tonight. And congratulations on getting published in BBC Good Food magazine, how exciting! Congrats on being published in BBC Good Food AND on being featured! That’s awesome! This cake sounds like it would be awesome for any kind of celebration… and I kind of want to lick my screen now, soooo…. good job! Congratulations on your news – That’s amazing! You are a lucky girl. This cake looks incredible! Love the thin layers with lots of icing mmmmm! Looks absolutely gorgeous! Love layer cakes! Yours looks so sophisticated and tall – WOW! I would love to have a slice of this cake right now, for lunch! Congrats, Jessica! Such exciting news! And what a great way to celebrate – this cake looks divine! Is there anything better than salted caramel buttercream? I really don’t think so! Oh My gosh .that looks DEVINE….i could dive in that right now…please may i?! 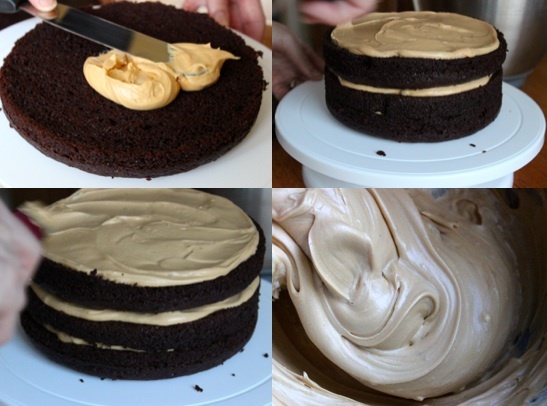 that is how all chocolate cake should look…and that buttercream…..Im so trying this!! Congrats on your news! How did that come about? I will have to keep an eye out for it 🙂 Also, wow. 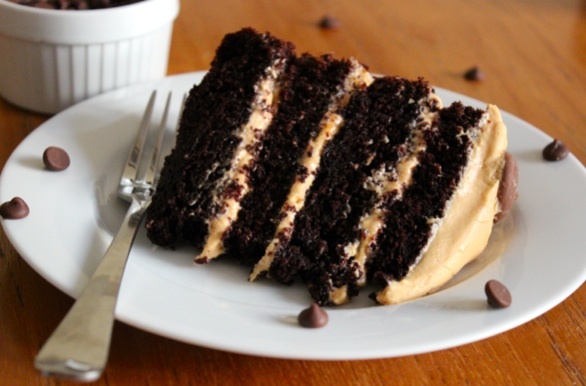 This recipe sounds incredible… I have to try that salted caramel buttercream! 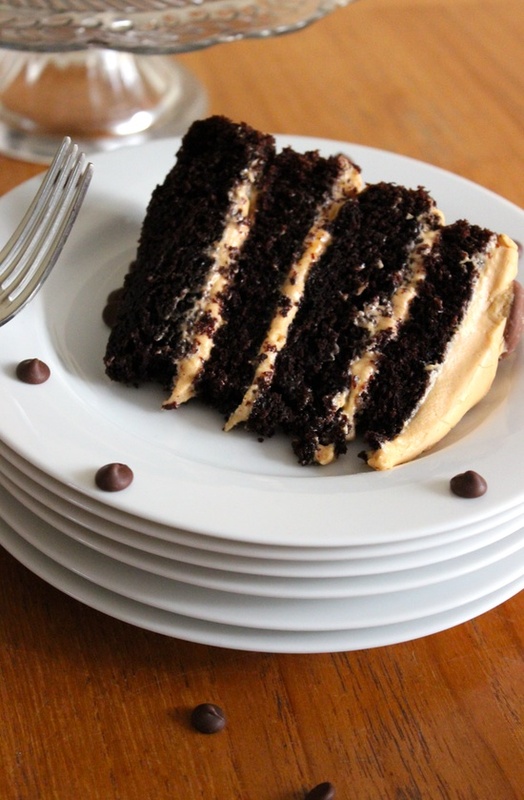 Any cake that involves chocolate, four layers, and a salted caramel buttercream gets two thumbs up from me! Yum! And congrats on your features! Going to make this cake for my daughters birthday, and turn it into a bear. Looks delicious! Chocolate, fudge and salted caramel are my favorite things! I cannot have this cake near me! Congrats on being featured in the magazine! :O This cake is worth all the applause in the world! It looks gorgeous Jessica ! I just pinned it! check out my Crème Brulee!! Hi! Can this cake be covered in fondant? Thanks! Hi Kimmy. Yes you can cover the cake with fondant roll out icing. The frosting needs to be changed – as the caramel frosting for this recipe doesn’t make enough to cover the outside of the cake. I would recommend using a your favourite chocolate fudge icing for this cake. That recipe will easily decorate 12 cupcakes or a layer cake like this one. Enjoy both recipes!